In this episode: Young viewers are fascinated as toy parts jump and play around, eventually coming together to create -- a doll stroller! TuTiTu - "The toys come to life" is a 3D animated television show targeting 2-3 year olds. ... TuTiTu Doll Stroller. Like? Share. Added by admin on 18/05/2013. 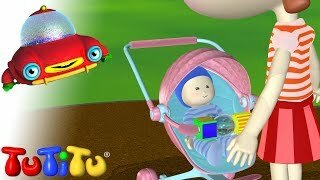 TuTiTu creates a doll stroller - 3D animation for toddlers Added by TuTiTu. Follow Added to Kids ♥ Videos! Shop for Doll Strollers from Graco, Journey Girls and others at Toys"R"Us. Your little girl will love showing her favorite doll the sights in her very own stroller.